Arizona junior Ka'Deem Carey's 1,716 rurshing yards rank second to Boston College's Andre Williams. Whether or not Tuesday’s AdvoCare V100 Bowl is Ka’Deem Carey’s last game in an Arizona uniformt, Arizona coach Rich Rodriguez is sure of one thing: Carey will run like he’s always run — hungry and determined. Why would his potential final game be any different than any other in his career? Andre would be Boston College’s Andre Williams, the nation’s leading rusher who was named the Doak Walker Award winner as this season’s top back. 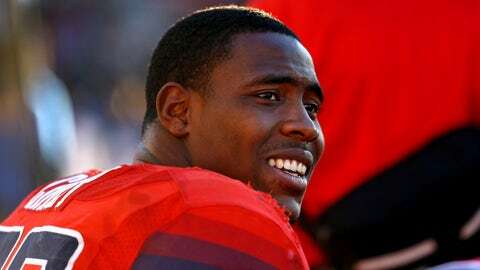 Ka’Deem is, well, Ka’Deem, the player who many Arizona faithful hope returns to Tucson and UA for a final season. He’s also a two-time consensus All-American and holder of multiple school records. Carey was the nation’s leading rusher a year ago and a Doak Walker finalist himself. These two backs will share the spotlight in Tuesday’s game in Shreveport, La. Whether he stays or goes, Carey, who rushed for 1,716 yards and 17 touchdowns this season, said he’s had a very good career so far when asked to reflect on his tenure in a Wildcats uniform. He said last year’s off-the-field incidents (leading to a suspension from this year’s season opener) have helped him be more responsible. He’s also a father now with plans for a successful future. The stakes on Tuesday morning "– New Year’s Eve – will hardly be small for Arizona. The Wildcats will be looking to win bowl games in consecutive years for the first time since 1997 (Insight.com Bowl) and 1998 (Holiday Bowl). The first order of business for UA – defensively – will be to stop the 6-foot Williams, a bruising back who rushed for more than 2,000 yards. BC will have the same task vs. Carey, Fischer reminded. Rodriguez said before the team left for Louisiana his team was enthusiastic about the game and had practiced very well. It did have a hiccup over the weekend when backup quarterback Javelle Allen was dismissed for violating undisclosed team rules. When it comes – if it hasn’t already – Rodriguez said the process will be for Carey, his family and him to sit down and discuss what’s next. "I step on that field and after the game — no matter the results — I know I gave it all I’ve got," he said. Where: Independence Stadium – Shreveport, La. Defensive strength: Arizona will have to do whatever it can to stop BC running back Andre Williams, the nation’s leading ground gainer. This will be as physical a game as the undersized Wildcats have played. 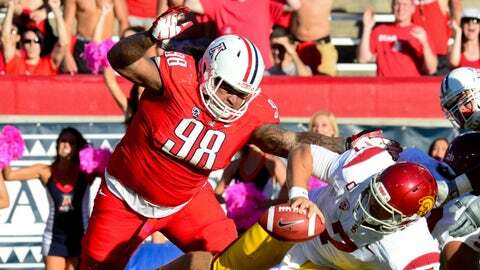 Look for Arizona to stack the line of scrimmage, daring BC to throw the ball. Ka’Deem’s finale? Arizona will ride the legs of junior runner Ka’Deem Carey, who could be in his last game as a Wildcat. He’s rushed for more than 100 yards in a game for 15 consecutive games. Expect another one. Denker factor: Arizona senior quarterback B.J. Denker will be looking for a positive finish to his career. He can’t do any worse than his mistake-filled performance in the regular-season finale vs. Arizona State, which came on the heels of a brilliant effort vs. Oregon. He’ll need to hit some passes for more than 20 yards to create running room for Carey. An 8-win season and a second consecutive bowl victory in coach Rich Rodriguez’s second season would be a nice consolation and provide some off-season momentum after the Wildcats stunk it up against arch-rival ASU in the regular-season finale. The Wildcats beat Nevada 49-48 in a dramatic comeback in last season’s New Mexico Bowl and are hoping for less drama this time around. When Denker’s played well, so have the Wildcats. When he’s struggled, likewise. BC will try to control the ball with Williams and keep it out of the Wildcats’ hands. If the defense can contain Williams even to a small degree, Arizona should be able to move the ball and put up points. First one to 30 wins.